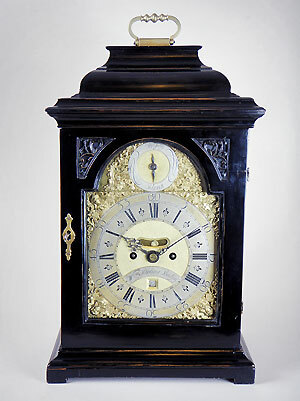 This is an ebonized bracket clock built in the second quarter of the 18th century by well-known clockmaker William Kipling. The inverted bell top is surmounted by a brass handle and has shaped side frets to a plinth base with block feet. 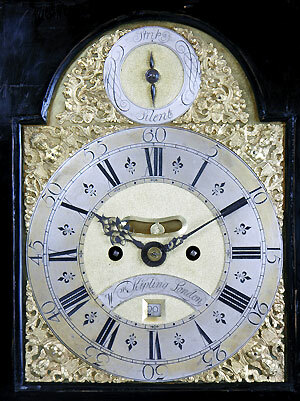 The eight inch arched brass dial has a strike/silent subsidiary dial in the arch over a Roman and Arabic chapter ring with a matted centre. 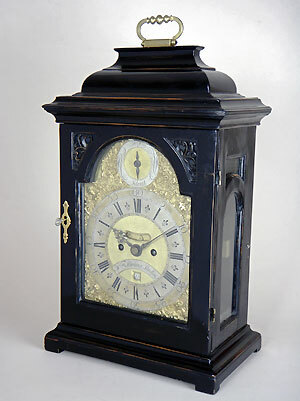 The clock has a chamfered mock pendulum and a date aperture. The twin fusee movement is united by five pillars, has verge escapement and is rack striking the hour on a bell. The backplate is heavily engraved.